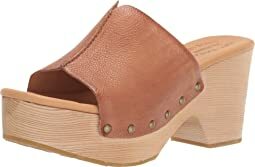 Originally created in 1953 out of Brooklyn, NY, Kork-Ease was intended to become a comfort shoe company. 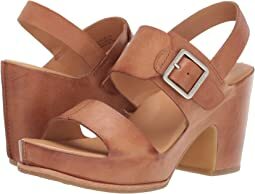 The simple, wearable design soon became a staple accessory of the ´70s fashion world defining the wedge genre. Kork-Ease is fashion´s new “go-to” shoe for a new generation of consumers. 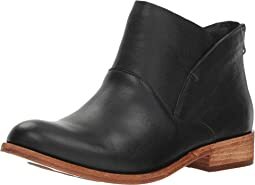 This is such a comfortable shoe, and very cute! The leather is soft and doesn't cut into my foot, and I like that the strap adjusts for a secure, custom fit. The size 10 is slightly too short. I am going to try a size 11, but I am afraid it will be too big. I wish the shoe came in a 10 /12. I have only worn these a couple of times but they are really comfortable. 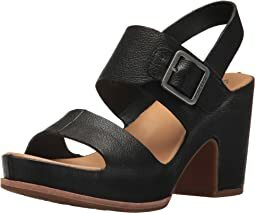 I love Kork-Ease shoes for comfort and fit. I wanted to love these shoes so much but the straps across the foot were way to wide and loose for my foot. There is no way to adjust these straps so unfortunately back they will go. I will say that they were super comfortable and I would have kept them if not for the strap issue. My problem with Kork Ease is always the same. The 8, my usual size, is too small by a bit... big toe at the edge, and the 9 is significantly too big. I thought that perhaps this style, because of the raised foot bed, might be okay, but nope. Too bad. I love the iconic style and the materials. I need an 8 1/2. Earth to Kork-Ease! Please! I like them a lot. My only complaint is that the front is perhaps a bit narrow and the heel perhaps a bit wide. They are super soft and cushioned nicely. Got them and wore them all day and they felt great! Love them! 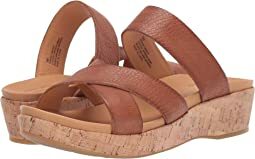 I wanted to love these sandals. I got them in navy and thought they would look cute with denim capri's. However, the strap around the foot is way too loose and my foot didn't feel secure. Too hard to walk in and no way to adjust and make tighter. 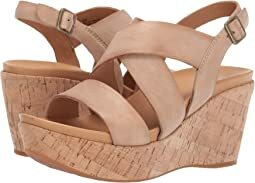 Otherwise, cork footbed seemed comfortable and length was fine. Unfortunately, I am going to have to send them back. Lovely shoes, super comfortable out of the box. Finally found the brand that understands my high instep and does great work! I used to be in love with Camper, but the prettiest models they have do not take it into account at all. This shoes are great quality and look as if they would last forever. Great cushion and arch support, nothing flimsy or cheap looking. This is truly dressy AND comfortable pair! I have a little bit of a narrow foot. Very stylish and very comfortable shoes. They feel like shoes I could walk in all day...... but they slip off my foot easily unless I'm gripping with my toes consciously to keep them on. Loved the sandal but did have to return. I usually wear an 8.5 but I ordered the 8 based on reviews and the overall size was perfect! BUT my problem is that on the top of my foot, there is too much space between my foot and the sandal. If my feet were a little bit chunkier the sandal would have been perfect. Well made shoe. Size 11 was right length for my foot but too wide. Nice shoes. Size 11 right length for my foot but too wide. Nice boots. As with so many shoes in size 11 they were way too wide. Wish they came in narrow. I adore these shoes! Comfortable from the moment I put them on and really cute. A bit of height is really nice for us petites! I bought the tan, which is a very nice neutral color. I came back for the black! I returned this sandal because it’s too uncomfortable to wear. I buy this brand for the cushiony feel. I can’t wear completely flat shoes or hard-soled shoes and these are both. There’s no “kork” or “ease” feel to them at all. This is the second pair of flat sandals I’ve returned for this reason. 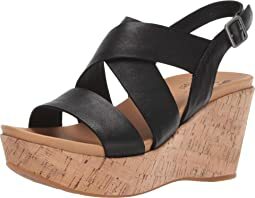 I love the wedges, super comfortable, but the flats are a no go. Shame because I like the styles! These are adorable shoes. However, they run at least a half size short; my toes are hanging off the end! So I am going to have to return my 9s and try a 10. The toe area is a bit wide for my medium width foot, but I hope that the larger size might be ok. I will let you know! Well, once again went against reviews and crossed my finger. The fit is perfect!! Ordered true to my size and received exactly that,a perfect fit. Super cute, and very comfortable. Live my purchase!!! 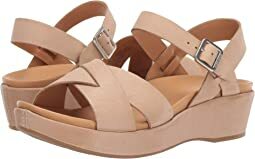 These sandals are very cute, i love the style of straps and width of the straps, unfortunately the footbed is made for Barbie dolls, I've never see such a narrow toe in a sandal before, three of my toes hung off the edge when I stood normally. The sizing was correct lengthwise but the toe area width was so narrow it was almost funny. 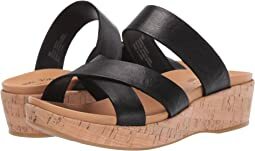 Unless your toes don't splay out at all when you stand these sandals will unfortunately cause you to have gorilla toes, hanging over the edge of the sandal looking very unbecoming. I hope they make this style again with a wider toe box. 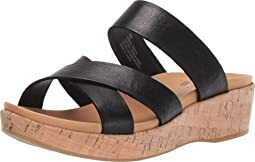 These are VERY comfortable and have the height I want without the weight. 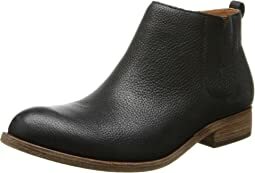 The top of this style shoes tends to find a way to rub either my toes or the top of my foot, but these do not.....the leather is soft and isn't thick with a hard cut edge. 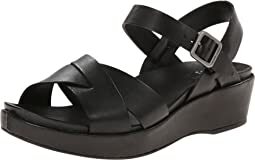 I wanted a platform I could dress up or down and one that didn't truncate my foot with an ankle strap......I bought the slate blue and it looks great with my jeans/dresses. Very happy, even at the pricey tag. I love these boots. They go with everything! Comfortable and Cute! Very cute--but too tight on top for top of my foot. Can't even slide them in. Had better luck with the Vionic pepper--which is adjustable across the top. TTS, just a bit too wide.